This article was originally published in Global Trade Magazine on Sept. 26, 2018. 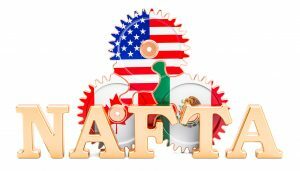 There are currently a great number of business owners, corporate executives and front-line workers across North America holding their breath in anticipation of what they believe will be the outcome of the NAFTA negotiations on or before September 30. That’s the date set out by Washington to deliver the text of a deal with or without Canada before making public (within 30-days) the text to the bilateral trade deal the United States struck with Mexico on August 30. The US administration is following the time constraints designated by the Trade Promotion Authority, also known as fast track, to ensure the agreement is subject to a straight up-or-down vote by the US Congress. Any amendments would require the negotiations to be reopened. The fast-track timing allows for a total of 90 days for consultation with Congress and stakeholders to consider the proposed agreement prior to beginning the legislative ratification process. This also coincides critically with December 1, when Mexico transitions power to its new President Andrés Manuel López Obrador. The current administrations both of Mexico and the United States would prefer to see the deal ratified by both countries in advance of Mexico’s new president taking power as there is concern from both countries that his administration could reject some of the provisions, forcing the parties back to the negotiating table. However, Canadian officials have been taking a hard line in negotiations and have stated they would rather have no deal than bind Canada to a bad deal. They also feel that the US Congress would only support a trilateral free trade deal. However, that support was called into question recently when Republican Congressman and House Whip, Steve Scalise, made a statement suggesting Congress was growing impatient with Canada’s negotiating tactics. That could be just tough talk in hopes of hastening the conclusion of negotiations that have been going on for more than a year in advance of a critical mid-term election and the initiation of a new government in Mexico. Canada hopes so, but also knows that President Donald Trump has demonstrated his willingness to staunchly uphold his negotiating positions. With the deadline upon us, the question is, what happens if Canada and the US don’t sign a deal? As has been the case throughout the NAFTA negotiations, the answer isn’t black and white.